0 Comments Published by KL Ocs Kid on Wednesday, October 21, 2009 at 11:36 AM. 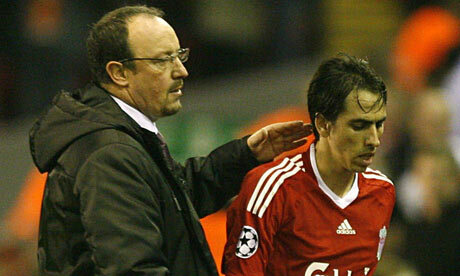 By rights a manager should not feel the breath of the mob on his neck five months after his team finished second in the Premier League with 86 points and two defeats but there was a sense at Anfield last night that Rafa Benítez's reign is unravelling – not fast enough for him to go the way of Gérard Houllier yet but with sufficient speed to strain his bond with The Kop and encourage Manchester City, Spurs and Aston Villa that the Big Four are finally cracking up. A fifth consecutive defeat, against Manchester United here on Sunday, would erase Anfield's Premier League title hopes and move United closer to the day when they surpass the record of 18 league championships they currently share with the red half of Merseyside. Houllier was here to see the French club he once managed stretch Benítez's credibility to its most frayed condition since the great Champions League final comeback of 2005 seemed to mark him out as an inspirational leader who wore some of Bill Shankly's stardust. The Liverpool script discourages apocalyptic readings of a run of bad results. The club's intimate acquaintance with melodrama suggests United might be impaled at the weekend and Benítez will wear his smuggest mask. But consecutive losses to Fiorentina, Chelsea, Sunderland and now Lyon speak of a deepening vulnerability. There are plenty of bit-part players in this Liverpool squad. If a rump decide that Benítez's power base is dissolving, then the small core of genuine match-winners and diehards will end up isolated. They cannot save Liverpool's campaign without help from the army of also-rans Benítez has imported to play alongside Steven Gerrard and Fernando Torres, who are both struggling to be fit for the United game. A shortage of firepower was last night's banner message to those in charge. Torres is the exception to You'll Never Walk Alone. The world's best centre-forward is doing pretty much that in a Liverpool squad agonisingly short of elite strikers. In the absence of El Niño against Lyon, goalscoring responsibilities fell chiefly to the 20-year-old David Ngog, who can count his goals for the great Anfield institution on the digits of one hand. For the home of Ian Rush, Roger Hunt, Kenny Dalglish, Robbie Fowler and Michael Owen to be so short of marksmen suggests someone in authority needs to stay behind for extra maths. The blame game between owners and manager always renders it hard for The Kop to identify the culprit but Liverpool are stuck with a manpower shortfall in a part of the team famed for its predators. This imbalance has burdened Torres and Gerrard with the responsibility to net goals at the pace Lennon and McCartney used to churn out songs. There was no Torres in this Champions League Group E match and soon no Gerrard either as the captain hobbled off after 25 minutes. Ngog, meanwhile, had made only 22 appearances since joining from Paris St Germain in July last year and has looked wispy and fragile in top-flight action. Nor is his control immediately redolent of the top French finishing schools. At this point in his development he is too easy to dispossess to be a credible deputy to Torres. His night ended ignominiously with a hamstring pull. The forward shortage is explained by the club's failure to replace Peter Crouch and Robbie Keane, the two big sales in that department post-Owen and Fowler. Behind Torres, who has scored eight times this season but is hindered by abdominal trouble, a merry cast of hopefuls have laboured to fill the menace-void. Those four consecutive defeats have cast an unforgiving light on the sharp end of Benítez's squad. Beyond Ngog the options are Andriy Voronin (six goals in 35 appearances and a loanee to Hertha Berlin last season), Nabil El Zhar (one in 25), who is really an impact winger, Kuyt and Ryan Babel, who can play through the centre but is lost in the tundra of Benítez's displeasure. Frost forms on those Benítez considers to be inconsistent or unreliable. For Liverpool to go into combat in 2009-2010 with only one top-grade centre-forward points to a bad tangle of politics, judgment and arithmetic. At least the £20m midfielder Alberto Aquilani is close to fitness and Javier Mascherano cannot be subdued forever. For The Kop, though, this was not meant to be another year of hole-plugging and Scouse defiance. It was supposed to be the campaign when a 20-year wait came to an end. From last season's strong core Xabi Alonso has left, part of Mascherano is elsewhere and Torres and Gerrard are beset by injury. Anfield's best European roar was only briefly heard last night. Though Benítez is still popular, a faith-deficit has crept back in. The Kop know the value of finishers, of goal-getters. They ask where all the red ones went.